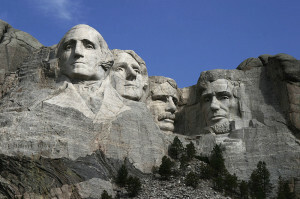 Barack Obama Bust to Be Added to Mount Rushmore? WASHINGTON — A recent survey of political and history professors at George Washington University discussed whether Barack Obama should be included on Mount Rushmore, even if not in the near future. The survey was conducted the The College Fix, and polled 10 professors at the university. Two said yes, but urged caution as to the timing. “I recall how unseemly it was when Republicans started a premature campaign to cement President Reagan’s legacy by naming everything they could find after him,” added political science professor Robert Stoker. An Obama supporter holds a poster depicting Obama’s bust on Mount Rushmore during the 2013 Presidential Inauguration. 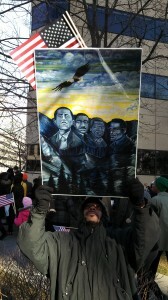 As previously reported, during Obama’s inauguration in January, some supporters held signs that depicted Obama’s bust on the side of Mount Rushmore next to Martin Luther King and other African American leaders. It also appears that a campaign to include Obama on Mount Rushmore beside George Washington, Thomas Jefferson, Theodore Roosevelt and Abraham Lincoln has been underway for quite some time. A Facebook page entitled “Campaign to Put President Obama on Mount Rushmore” was created in March of 2010. “With the numerous accomplishments that President Obama has achieved in under 15 months in office, including the healthcare bill, we the people feel the president should be honored and recognized by his bust being placed on Mt. Rushmore,” the page outlined upon its inception. However, the page is smathered with comments from dissenters who disagree with the idea of adding Obama to the historic monument. “You have to be kidding,” one visitor writes. Earlier this year, on his MSNBC television program Politics Nation, Al Sharpton made the case for why he thinks Obama might stand a chance to be included. A simple Google search proves true that Ludlum Elementary School in Hempstead, New York now is known as Barack Obama Elementary School, and that two relatively new schools in Pine Lawn, Missouri and Upper Marlboro, Maryland both bear his namesake. The Barack Obama Male Leadership Academy for grades 6-10 operates in Dallas, Texas, and the Barack and Michelle Obama Service Learning Elementary is open for students in Saint Paul, Minnesota. Other locations include Milwaukee, Wisconsin, Pittsburgh, Pennsylvania and Oakland, California. “History undoubtedly will accord President Obama a special place by virtue of being the first African American President,” Professor Paul Wahlbeck of George Washington University stated, noting that it may not necessarily be on Mount Rushmore. However, some believe that efforts to venerate Obama have already gone too far.